Following in the tradition of great basketball documentaries like Hoop Dreams and The Heart of the Game, More Than a Game is an inspiring, insightful and extremely well done sports documentary that details a true story with more excitement and drama than even the best fictional ones. Although I wouldn't go so far as to say that it is better than those aforementioned films, it is terrific nonetheless and should be seen by any film lover or basketball connoisseur. More Than a Game is about the "Fab Five," a group of five guys in Akron, Ohio who came together under the guise of basketball to form everlasting friendships and prove themselves worthy to the world. It follows them from middle school up until the end of high school on their journey to call themselves national champions. This is a movie that has quickly been dubbed as "the Lebron James documentary," but it is not and should not be labeled as such. It's easy to see why the filmmakers would promote James as the star (and I suspect they welcome the "Lebron James documentary" label) and it does indeed have a focus on him, but only when prudent to the story. It would be easy to simply show his skills on display, but it goes beyond that and never boosts his ego by concentrating on him when the story doesn't call for it. It isn't until James lands the cover of Sports Illustrated, has his face plastered all over ESPN and finds himself in a bit of controversy that the movie starts to discuss his individual impact on the team. As far as it is concerned, each person on the team is as vital a part to the story as James and I loved how it restrained itself from further worshipping him as the second coming of Michael Jordan. Though it's hard to fault it for its tight, focused story, I wish it would have further explored the boys' relationships and societal issues that they were facing at the time. After middle school, all of them decide to not go to the all black high school in their town, but rather another one with a coach they felt would help them achieve their dreams, despite it being a predominantly white school. If the fact that they didn't go to the all black school is significant enough to bring up, why not delve into race relations? The movie may have rightfully restrained itself from bowing down to Lebron, but it shamefully restrained itself from creating relevant societal connections, all of which were right in front of them, but ignored. Because of its simple structure and its desire to solely tell the story of a high school basketball team, More Than a Game severely limits itself in scope and size. Those who are not in love with the sport may not find much to enjoy here, but those who are will find themselves lost in the drama and spectacle that unfold onscreen. 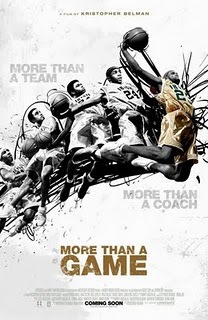 It's no Hoop Dreams, but More Than a Game is a serviceable basketball documentary that is well worth seeing.